Worse, Standard & Poor’s has now taken up the hatchet. Some bloggers are calling it blackmail. This private, for-profit rating agency, with a dubious track record of its own, is dictating government policy, threatening to downgrade the government’s long-held triple AAA credit rating if Congress fails to deal with its deficit in sufficiently draconian fashion. The threat is a real one, as we’ve seen with the devastating effects of downgrades in Greece, Ireland and other struggling countries. Lowered credit ratings force up interest rates and cripple national budgets. The biggest threat to the dollar’s credit rating, however, may be the game of chicken being played with the federal debt ceiling. Nearly 70 percent of Americans are said to be in favor of a freeze on May 16, when the ceiling is due to be raised; and Tea Party-oriented politicians could go along with this scheme to please their constituents. If they get what they wish for, the party could be over for the whole economy. The Chinese are dumping U.S. Treasuries, and the Fed is backing off from its “quantitative easing” program, in which it has been buying federal securities with money simply created on its books. When the Fed buys Treasuries, the government gets the money nearly interest-free, since the Fed rebates its profits to the government after deducting its costs. When the Chinese and the Fed quit buying Treasuries, interest rates are liable to shoot up; and with a frozen debt ceiling, the government would have to default, since any interest increase on a $14 trillion debt would be a major expenditure. Today the Treasury is paying a very low .25% on securities of 9 months or less, and interest on the whole debt is about 3% (a total of $414 billion on a debt of $14 trillion in 2010). Greece is paying 4.5% on its debt, and Venezuela is paying 18% — six times the 3% we’re paying on ours. Interest at 18% would add $2 trillion to our tax bill. That would mean paying three times what we’re paying now in personal income taxes (projected to be a total of $956 billion in 2011), just to cover the interest. There are other alternatives. Congress could cut the military budget — but it probably won’t, since this option is never even discussed. It could raise taxes on the rich, but that probably won’t happen either. A third option is to slash government services. But which services? How about social security? Do you really want to see Grandma panhandling? Congress can’t agree on a budget for good reason: there is no good place to cut. Fortunately, there is a more satisfactory solution. We can sit back, relax, and concede that Cheney was right. Deficits aren’t necessarily a bad thing! They don’t matter, so long as they are at very low interest rates; and they can be kept at these very low rates either by maintaining our triple A credit rating or by borrowing from the Fed essentially interest-free. Under our current monetary scheme, debt and deficits not only don’t matter but are actually necessary in order to maintain a stable money supply. The reason was explained by Marriner Eccles, Governor of the Federal Reserve Board, in hearings before the House Committee on Banking and Currency in 1941. Wright Patman asked Eccles how the Federal Reserve got the money to buy government bonds. “We created it,” Eccles replied. That could explain why the U.S. debt hasn’t been paid off since 1835. It has just continued to grow, and the economy has grown and flourished along with it. A debt that is never paid off isn’t really a debt. Financial planner Mark Pash calls it a National Monetiztion Account. Government bonds (or debt) are “monetized” (or turned into money). Government bonds and dollar bills are the yin and yang of the money supply, the negative and positive sides of the national balance sheet. To have a plus-1 on one side of the balance sheet, a minus-1 needs to be created on the other. Except for coins, all of the money in the U.S. money supply now gets into circulation as a debt to a bank (including the Federal Reserve, the central bank). But private loans zero out when they are repaid. In order to keep the money supply fairly constant, some major player has to incur debt that never gets paid back; and this role is played by the federal government. That explains the need for a federal debt, but what about the “deficit” (the amount the debt has to increase to meet the federal budget)? Under the current monetary scheme, deficits are also necessary to avoid recessions. Here is why. Private banks always lend at interest, so more money is always owed back than was created in the first place. In fact investors of all sorts expect more money back than they paid. That means the debt needs to be not only maintained but expanded to keep the economy functioning. When the Fed “takes away the punch bowl” by tightening credit, there is insufficient money to pay off debts; people and businesses go into default; and the economy spins into a recession or depression. Maintaining a deficit is particularly important when the private lending market collapses, as it did in 2008 and 2009. 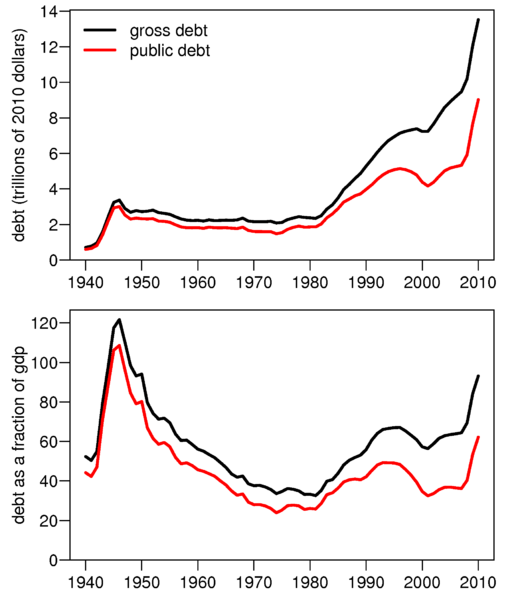 Then debt drops off and so does the money supply. Too little money is available to buy the goods on the market, so businesses shut down and workers get laid off, further reducing demand, precipitating a recession. To reverse this deflationary cycle, the government needs to step in with additional public debt to fill the breach. (c) the money created by the debt has been used to produce goods and services, allowing supply and demand to increase together and prices to remain stable. The Japanese economy was doing very well until 1988, when the Bank for International Settlements raised bank capital requirements. The Japanese banks then tightened credit and lent only to the most creditworthy borrowers. Private debt fell off and so did the money supply, collapsing the stock market and the housing bubble. The Japanese government then started spending, and it got the money by borrowing; but it borrowed mainly from its own government-owned banks. The largest holder of its federal debt is Japan Post Bank, a 100% government-owned commercial bank that is now the largest depository bank in the world. The Bank of Japan, the nation’s government-owned central bank, also funds the government’s debt. Interest rates have been lowered to nearly zero, so the debt costs the government almost nothing and can be rolled over indefinitely. Japan’s economy remains viable although its debt-to-GDP ratio is nearly four times that of the United States, because the money does not leave the country to pay off foreign creditors. Rather, it is recycled into the Japanese economy. As economist Hazel Henderson points out, Japan’s debt is twice its GDP only because of an anomaly in how GDP is calculated: it omits government-provided services. If they were included, Japan’s GDP would be much higher and its debt to GDP ratio would be more in line with other countries.’ Investments in education, health care, and social security may not count as “sales,” but they improve both the standard of living of the people and national productivity. Businesses that don’t have to pay for health care can be more profitable and competitive internationally. Families that don’t have to save hundreds of thousands of dollars to put their children through college can spend on better housing, more vacations, and other consumer items. Locke calls the Japanese model “a capitalist economy with socialized capital markets.” The national debt has been “monetized” – turned into the national money supply. The credit of the nation has been turned into a public utility. Thomas Hoenig, President of the Kansas City Federal Reserve, maintains that the largest U.S. banks should be put in that category as well. At the National Association of Attorneys General conference on April 12, he said that the 2008 bank bailouts and other implicit guarantees effectively make the too-big-to-fail banks government-guaranteed enterprises, like mortgage finance companies Fannie Mae and Freddie Mac. He said they should be restricted to commercial banking and barred from investment banking. But that is the system that we have. Deficits don’t matter in this scheme, but the interest does. If we want to keep the interest tab very low, we need to follow the Japanese and borrow the money from ourselves through our own government-owned banks, essentially interest-free. “The full faith and credit of the United States” needs to be recognized and dispensed as a public utility.